In this activity, students will learn about population growth and limits to growth. Students will play the part of members of a growing population and experience limits to the growth of populations when resources are limited. Students will analyze different patterns of population growth including exponential and logistic growth and will learn the ecosystem concept of carrying capacity. Watch a video of students playing the game "Papercatchers"
Watch the video of students playing the game "Papercatchers” based on simple rules. Possibly most important, ecosystems often demonstrate emergent behavior. This is related to the first point, where the overall behavior turns out not to be obvious from the component behavior. In a high desert ecosystem, simply knowing that rabbits eat grass, coyotes eat rabbits, and mountain lions eat rabbits and coyotes, doesn't tell us much (beyond giving us a general sense) about the patterns in the respective populations over time – we really need to study the ecosystem as a whole. From the above, we can see that ecosystems are usually complex adaptive systems, as well. Could we model the Papercatchers on the computer? If so, how? Who would be the agents, environment, interactions? 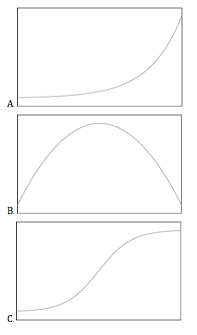 Which of the following is NOT a characteristic of complex adaptive systems as seen in ecosystems? Consider the following population growth patterns shown in the plots (where the y-axis is population size and the x-axis is time). Which population growth pattern would you expect to see when there was no resource limitation? Which population growth pattern would you expect to see when there was a resource limitation? Reflect on the correspondence between the model of Papercatchers and patterns of growth in real-world ecosystems. What characteristics of complex adaptive systems can be seen in an ecosystem? What is an ecosystem in your community that you could model for your final project? Post your reflections in your portfolio in the section "Reflections->Complex Adaptive Systems" under the heading "Papercatchers."